We prove (the excellent case of) Schreyer’s conjecture that a local ring with countable CM type has at most a one-dimensional singular locus. Furthermore we prove that the localization of a Cohen-Macaulay local ring of countable CM type is again of countable CM type. This is one of a series of papers that I wrote with Craig Huneke while I was at Kansas. Schreyer’s 1987 survey article on finite and countable CM type has been a wellspring of ideas for me (and, I think, others who think about these things). Craig and I were mostly focused (as I recall) on proving things for countable CM type that were already known for finite CM type, like descent from the completion, etc. 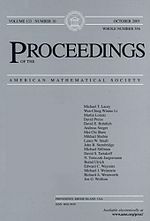 We were especially interested in applying the techniques we’d used to prove Auslander’s theorem (in Two theorems about maximal Cohen-Macaulay modules) to the more general situation. It didn’t turn out that way, but we were able to give what I think are very nice arguments, one using prime avoidance and a pigeonhole argument, and one using CM approximations. Even more interesting, we gave a couple of quite tempting conjectures about the relationship between the singular locus, countable type, and finite type. Morally speaking, the only thing that distinguishes between finite and countable type should be the singular locus.